It’s a common question. Is there a place for book apps alongside traditionally printed books? How should teachers make use of this new media? Why should we use interactive books? Always begin with this question, why are you considering buying eBooks? Do you have devices in school already that will make use of them? Have you considered purchasing costs? Are you buying copies of treasured books or working with new authors? I think these questions are important because they will have an impact on the kinds of books you buy. How many iPads/devices do you have? Are you looking for textbooks for a 1:1 project? When will the books be accessed? 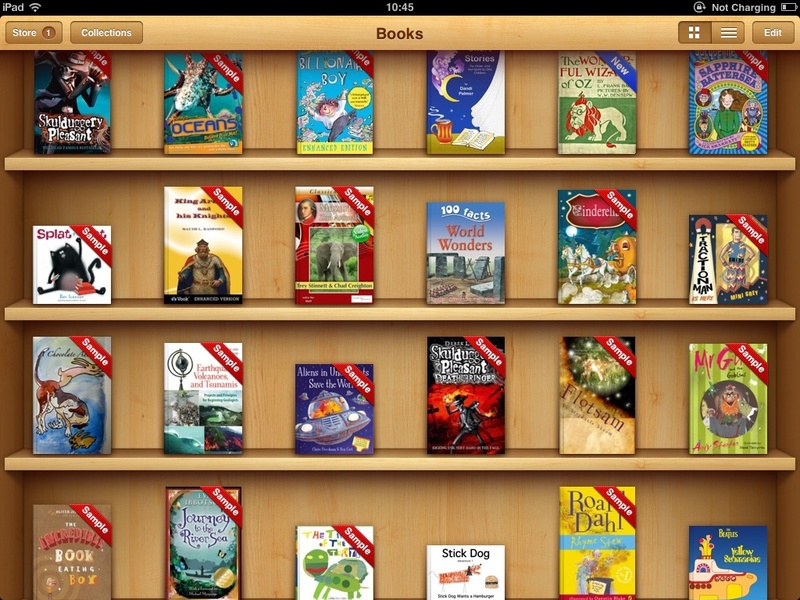 iBooks is easy to search and most books are dowloadable as samples. Web based services allow books to be accessed on screen, often compatible with many operating systems, but not always downloadable. Britannica e-books is one such service. Scholastic also run services where books can be accessed online, often through themes or authors focus. More and more books now will come with digital copies, which are perfect for displaying on whiteboards. Kindle runs as an app on iPads, online and within Kindle readers – great for regular access, though not as whizzy looking as ios apps. (This is changing as Kindle readers become full colour!) Kindle can be cheaper and as the app is android as well, very accessible to parents as well as teachers. If you are looking for textbooks, use the iBookstore but also take a look at the DK range of apps. All very high quality. I often get asked about book apps for iPads. My advice is to choose books that link well within unit teaching and make most of their interactivity. It is also a good idea to let the children choose themselves occasionally! Perhaps a project for school council or digital leaders? Here is a quick run through of some of the best book apps I’ve seen. Make use of creative apps for activites, see my guided reading apps for ideas. Great for inference and problem solving! Often find the children running through books or furiously swiping the screen? Try Bartleby’s Book of Buttons This book is one of the best I have seen. Each page poses a problem, with the solution hidden within the page. For example he may have a ticket with the time to leave on it, and the reader has to change the clock to that time before they can turn the page. Great illustrations and loads of options make this one you really should try. Perfect for inference and encouraging those higher level 3 readers to pay attention to the text! Great for character and dialogue. 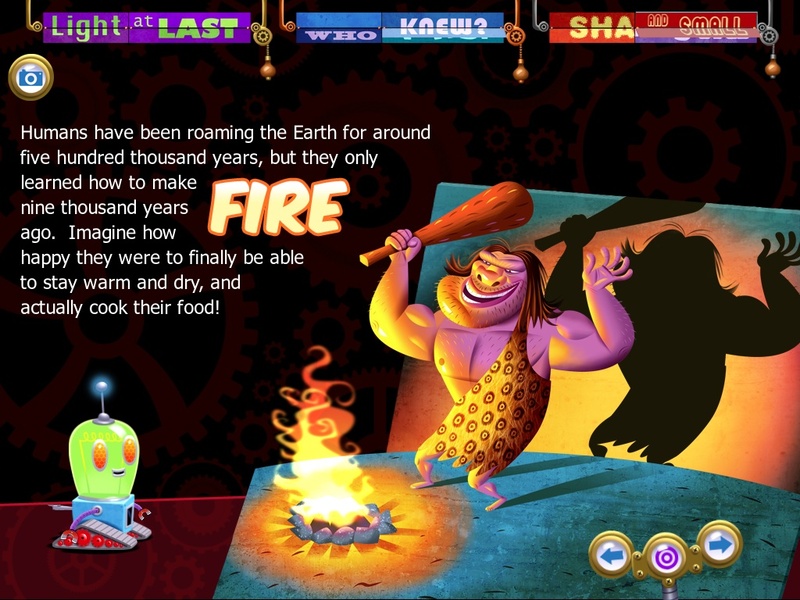 Two things in book apps will really support young readers with character and dialogue. Firstly the quality of the voice acting, and secondly the ability to record the narrative themselves. 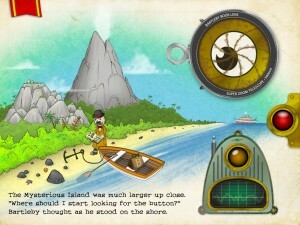 Using book apps as a chance for drama, speaking and listening and creating characters is the perfect enhancement. For this, I found it tricky, many publishers are now warming to the idea of a record your own narrative feature. 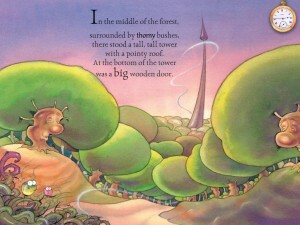 An example would be Ocean Media Houses’ Dr Seuss series. Some are put off because of the voice acting, (though what else would Dr Suess stories sound like?!) However the chance to record your own narrative changes that. Suddenly the possibilities are endless! A very special mention should also go to the Nosy Crow series. Their gorgeous looking apps are not only brilliantly narrated but tapping the characters in the story reveal more of their thoughts. Very useful for when you want to encourage discussion about dialogue, or encouraging children to sequence stories. Sir Charlie Stinky Socks, brilliantly narrated and excellent for whole class storytelling. Other stories which are great for dialogue include Sir Charlie Stinky Socks and Cosmo. These also include some great activities, such as sequencing stories which can be useful. The other great thing about eBooks, is that it can motivate some children to read where they otherwise may not do. Ofsted recently saw a guided reading session where a group was using iPads and commented that the children were incredibly engaged, especially the boys. Purchasing some key texts, whether from iBooks, or as an app, could really support reading in the classroom. Try some of the comic apps as well, Comics4Kids offers some great comics, which are very child friendly. Some iBooks, such as David Walliams’ Gangster Granny offer video from the author, and reading aloud of the text. Try searching for ‘enhanced’ books in the store. Special mentions should also go to Atomic Antelope’s adaption of Carroll’s Alice, which comes in an abridged and full version and has amazing visuals. 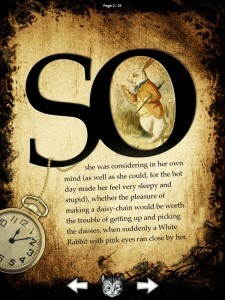 Atomic Antelope’s adaptation of Alice will be a hit with Yr 5/6 readers. Meanwhile, for younger readers there are many options, Collins Big Cats have a range of apps which allow the reader to completely rebuild and then share their own story! Searching for non-fiction and topic books will yield some gems, such as this Bobo and Light. Finally, another great thing about eBooks is that they can make use of the whiteboard in the classroom. See the link here for linking iPads to the whiteboard. Books that the children have copies of in the class library that can also be displayed for more focussed literacy work. The Heart and a Bottle deserves a special mention here as it is an amazing story and the app is delightful, with brilliant voice acting. However do search the iBookstore for your favourite authors, many of them are adapting their stories for the big screen!! 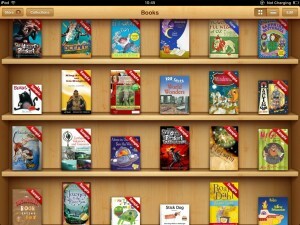 I will continue to add great book apps as I find them. Do please add any gems you’ve found in the comments sections! Posted by RS on February 17, 2013 in iPad, Literacy, Teaching and Learning.